Every puzzle has an answer! Will you be downloading the professor's latest title? Professor Layton and the Azran Legacy is the final iteration in the current trilogy and is due to arrive on 8th November in Europe, while North America will get puzzling next year. The 3DS title will of course be available in the eShop and will be a fair sized download. You'll need to have 7,309 blocks available in order to get hold of the digital version, which is just under a GB at about 914MB. To put that in perspective, Super Mario 3D Land takes up 4,096 blocks (512 MB), while Mario Kart 7 is 8,192 blocks (1 GB). It seems Professor Layton and the Azran Legacy has quite a few puzzles crammed in there, though file sizes aren't the most scientific indicators to how much content is available in a game. Professor Layton and the Azran Legacy sees the puzzlemaster himself combine with his companions Luke and Emmy to solve the many vexing enigmas of the Azran civilisation. Though it will be available at retail, the digital version may be appealing as you can quickly dive in and out of puzzles without switching cartridges. 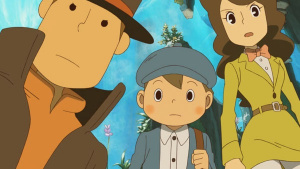 Will you be downloading a copy of Professor Layton's latest adventure? Let us know in the comment section below. FEA was about that size. To compare, Miracle Mask was 6,323 Blocks. Roughly 790 MB. Still, nothing can compare to Resident Evil Revelations' 25,795 Blocks, or 3.1 GB. I'll probably be buying the game at retail. I bought Miracle Mask digitally, which peeved my older brother. However the daily puzzle feature is convenient for digital copies. Speaking of which, only 4 days until all the daily puzzles are released. I'm still bitter from the Layton 7 announcement. I'm still excited for the game, and I'm glad it's coming to NA next year as I'm very busy this school semester. I've got the other 5 physically. They're sitting on my shelf in chronological order, so I'll buy this at retail to complete the collection. Anyone know the block size for Ace Attorney 5, since I'll be picking that up this week? Also may pick up Murder on the Titanic while it's £2, so a block size on that would be helpful too. I swear Nintendo are wizards. Mario 3D Land only 512 MB? How is that possible??? I can't say I'm disappointed about this coming out next year. Christmas is coming, and all of my free money is going toward gifts and such. Pokemon was my last major purchase of the year. @Ralizah what about Zelda that will be my last game this year! All the voice acting, I'm guessing? I've bought all of the games in retail.. and if this is the last true Layton games, I'll buy it for the self.